Doppler Photo: Photos and stories by Omari Stephens: Can you hear me now? Our team has two cars for the 24 Hours of LeMons. The first is the Miata (seen here actually finishing a race). The second is a 1997 Saab 900 Turbo, officially and affectionately known as "Saab Story," in deference to the beleaguered state of its marque. And to a lot of other things, really. Anyway, with our experiences at the Saab's first race, the name certainly "rang" true, so to speak (don't worry, you'll get it later). The car is seen above, demonstrating its unique ability to cry anime-style tears on command. So, during our first race, the car didn't really finish any laps other than the parade lap. 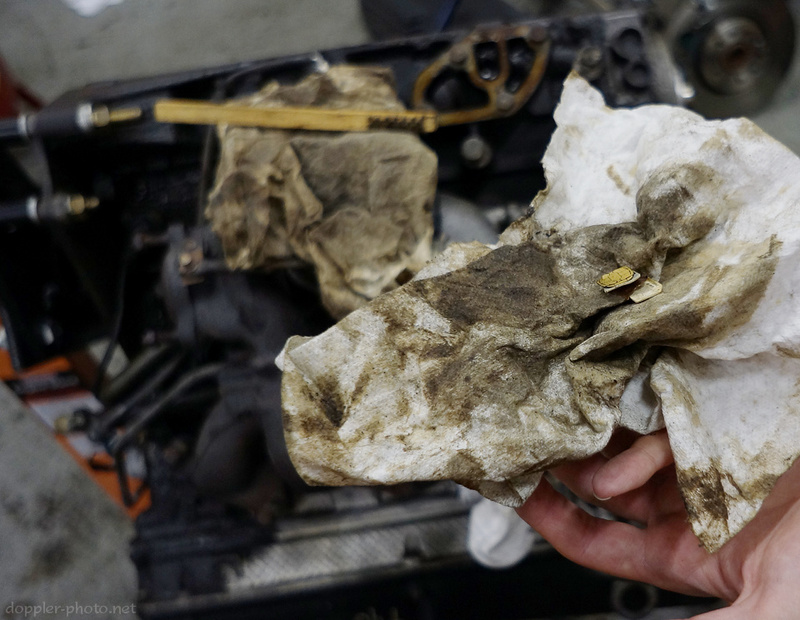 There were obvious engine problems, but the nature of the problems became a lot clearer once we pulled off the oil pan. 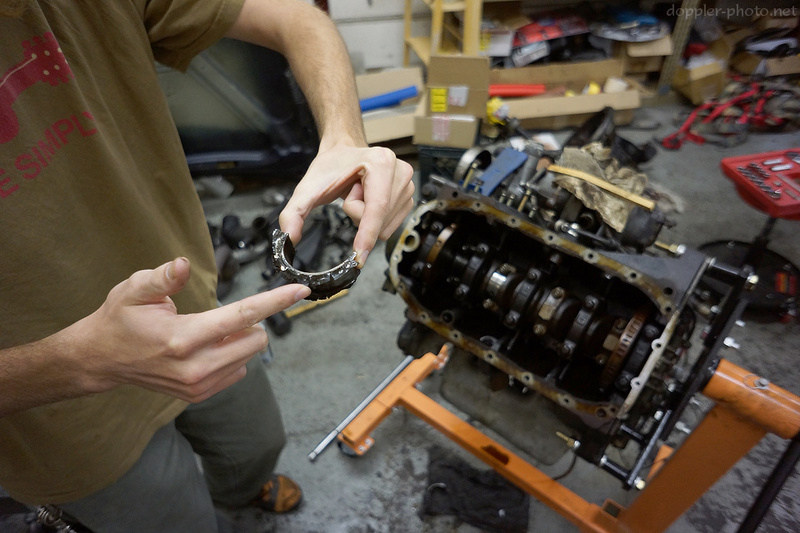 Hint: this is not how a rod bearing is supposed to look. Our theory was that something caused oil starvation, and the number-one bearing overheated and managed to extrude itself between the sides of the crankshaft and the sides of the piston rod. Verizon guy: "Can you hear me now?" Other side: "No, I've inexplicably dropped my SIM card into some dude's engine." We also found a sim card in the cabin air vents and underneath the carpet when we were stripping the car. And the shell of a nerita tesselata snail native to the south Caribbean. And a checkers hamburger token. And some random pills. And a spoon. And a country music tape (in a car that had no tape player this makes less sense). I'm struggling to find the pattern connecting all of those things. This car had a colorful life.